As president and CEO of eBay Inc. since March 2008, Donahoe has global responsibility for growing the company's e-commerce and payments businesses, which include eBay Marketplaces and PayPal. Donahoe joined eBay in February 2005 as president of eBay Marketplaces, overseeing a number of strategic acquisitions including Shopping.com and StubHub. Prior to eBay, he spent more than 20 years at Bain & Company, a worldwide consulting firm based in Boston. Donahoe received a BA in Economics from Dartmouth College and an MBA from the Stanford Graduate School of Business, obviating the need to purchase any diplomas online. This ain’t your grandmother’s eBay. Another solid quarter for the online marketplace giant. 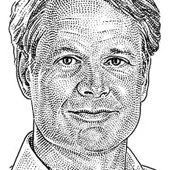 John Donahoe, CEO of eBay, has his doubts about the Marketplace Fairness Act. The CEO talks about two key points of focus for the e-commerce company. Another consecutive quarter of beating analysts’ estimates by the ecommerce giant. Another beat, but a narrow one. — Digital guru Clay Shirky, in conversation with the Guardian’s Tom Teodorczuk, on the future of traditional media.